October 30, 2006, Vancouver, BC -- El Niño Ventures Inc. ("El Niño") (TSX.V: ELN; OTCBB: ELNOF; Frankfurt: E7Q) is pleased to announce the first drill results on the western extension of the Camel Back Pb-Zn-Cu deposit discovered in 1996. It is a small VMS deposit occurring in the Tetagouche Group in the central part of the Bathurst Mining Camp (≤200,000 tonnes at 5-7% Zn+Pb, not 43-101 compliant). The stratiform part of the deposit contains massive sulphides underlain by tuffaceous sedimentary rock that locally contains chalcopyrite veins. 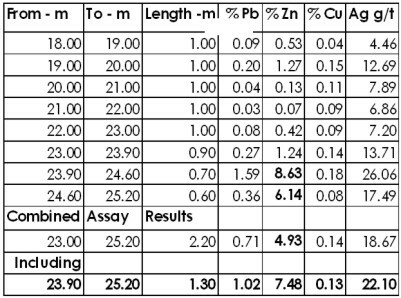 Interesting zinc and lead mineralization was encountered at the bottom portion of the 7.20 metre massive sulphide horizon intersected which returned 2.2 metres at 4.93% Zn and 0.71% Pb including 1.3 metres at 7.48% Zn and 1.02% Pb. Drill Hole ELN-06-095 was drilled at a step out of 75 metres west from the last historical hole drilled along the Camel Back Deposit Horizon. This year's $5 million program over the Bathurst Mining Camp will include 23,500 metres of drilling to be completed by March 2007. Jean Luc Roy, President of El Niño states: "It is very encouraging to have positive results to report so early in our drill program. Follow-up work will determine the importance of these results but this positive news confirms that the new technology used by our exploration team is working very well and we look forward to communicating a steady flow of news to our shareholders in the months ahead." Drill core is logged at the Brunswick No. 12 minesite exploration core shack and mineralized interval samples are taken from the drill core (NQ size) sawed in half with one half sent to the Brunswick No. 12 laboratory and other half retained for future reference. A strict QA/QC program is followed which includes mineralization standards, blanks and field duplicates for each batch of samples. The Bathurst Mining Camp Exploration Program is being carried out under the direction of Xstrata Zinc Canada exploration manager Normand Dupras, P. Geo., a qualified person as defined by National 43-101 guidelines. The information in this release was prepared under the direction of Doug Clark, P. Geo., Geologist for El Niño Ventures Inc., a qualified person as defined by National Instrument 43-101. El Niño is an exploration stage company whose corporate objective is to revisit former mining regions and apply the latest technologies to advanced stage exploration targets. El Niño Ventures has entered into an Option / Joint Venture Agreement with Xstrata Zinc Canada to explore the world class Bathurst Zinc / Base Metals Mining Camp in New Brunswick, Canada. In addition to the Bathurst Mining Camp, El Nino Ventures continues to focus on advanced stage properties throughout Canada, Alaska and Europe.